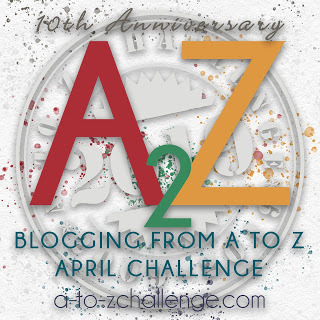 I am so far behind on my Blogging from A to Z Challenge. It never fails every time I set out to do a challenge I get sick. This time a cold/sinus infection. It came out of no where. . . well, kind of. It appears I was the last person to contract the cold from hell at work. Anyway, it’s catch up time. Their Eyes Were Watching God by Zora Neale Hurston is one of my favorite novels. I remember reading it in college. Well, I really didn’t read it my grandmother read it to me. I had a hard time with the dialect, but when she read it to me it was like a light bulb went off and the cherry on top is that my granny read it me.😍 Since then I’ve read it several times and each time I do I can hear my grandmother’s voice reading slowly and deliberately. and I want to talk about the strength of Janie Crawford, the protagonist. One of the things I do and shouldn’t is read reviews of my favorite books. And when there’s a negative view I take a personal affront. I say to myself, ‘you must be crazy’; ‘what were you reading?’ I did that very thing with Their Eyes recently and was absolutely gobsmacked by the number of people who didn’t see that Janie is a strong black female character. And the majority of these reader’s fail to realize that the novel is a coming-of-age story. A quest for independence. When Janie is 16 she comes to the realization that she wants to experience things, but she doesn’t know what or even how to go about it. And as suddenly as it’s realized it’s taken away from her. Janie is quite independent; which Nanny, her grandmother, knows. The first recollection I have of Janie’s independence is in chapter 2 when Nanny tells her that Logan Killicks is interested in having her as his wife. Naw, Nanny, no ma’am! Is dat what he been hangin’ round here for? He look like some ole skullhead in de grave yard. Lemme wait, Nanny, please, jus’ a lil bit mo’. Janie only marries Logan to pacify her grandmother and believes it when Nanny tells her that she’ll learn to love him. Janie also believes that because Logan has 60 acres and is self-sufficient she’ll experience things, but she doesn’t. She leaves him for Jody Starks who talks a good game about offering her independence and helping her realize her dreams. None of her dreams are realized while she is with Jody and she is supressed even more. Jody controls what she wears, where she goes, what she says, when she speaks, and who she speaks to. After 20 years of what we now realize is domestic abuse, Janie finds her voice. She humiliates him in the store just as he had done to her on so many occasions. Naw, Ah ain’t no young gal no mo’ but den Ah aint no old woman neither. As reckon Ah looks mah age too. But Ah’m uh woman every inchof me, and Ah know it. Dat’s u whole lot more’n you can say. You big-bellies round here and put out a lot of brag, but ’tain’t nothin’ to it but you’ big voice. Humph! Talking’ ’bout me lookin old! When you pull down yo’ britches, you look lad de change uh life. She also gets after him on his deathbed. Ah ain’t goin’ outa here and Ah ain’t gointu hush. Naw, you gointuh listen tuh me one time befo’ you die. Jody, you ain’t de Jody ah run off down de road wid. You’se what’s left after he died. Ah run off tuh kep house wid you in u wonderful way. But you wasn’t satidfied wid me de way Ah was. Naw! Mah own mind had tuh be squeezed and crowed out tuh make room for yours in me. Janie finally falls in love after she meets Tea Cake. She wasn’t forced to learn to love someone and she didn’t ‘fall’ in love with a pipe dream. While she was with Tea Cake she also learned the power of not speaking. That sometimes more can be said without words. Have you read the book? What do you think about Janie?